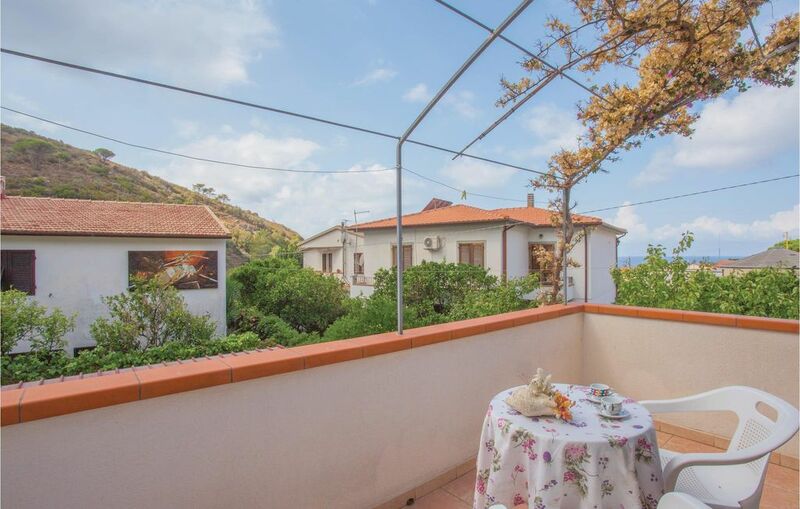 This holiday apartment with independent entrance is located on the west coast of the isle of Elba called “Costa del Sole” in the tiny village of Pomonte which offers both a pebble beach and large rocks. The small village, not yet discovered by mass tourism, offers the atmosphere you would expect in these Mediterranean surroundings: colored houses, some shops, narrow alleys and the square with the church and a bar, which is the meeting-point for both the local inhabitants and the tourists. Each night you will admire the beautiful sunset down on the beach and immediately after you will see the first lights of the isle of Corsica in front of you. Your apartment is located in the middle of the village, at abt. 300 m from the coast, and you can park your car at 60 m distance. Even if the apartment is attached to other houses, it offers a good privacy thanks to its independent entrance and the private outdoor space. Elba is a perfect place to spend a relaxing and authentic holiday: the Island of Elba is not only sea and coasts. Discover the nice inland too! Even though it is only 224 square kilometers, there is something to do for everybody: aquariums and mines that might interest your children, museums and places of historical interest for art and culture fans, scenic, nature and archeological view points for those who love a holiday in the open air, and small restaurants and wine cellars for those who enjoy good food and wine. The harbor of Portoferraio is at 28 km only.